Is It Okay To Laugh At Genocidal Monsters In The Name Of Selling Chicken? South African fast food company Nando’s, a brand with a history of pushing boundaries, makes light of murderous dictators in its latest campaign. Does it make you laugh or spoil your appetite? Dictators: They’re just like us. They enjoy dinner parties, the odd trip to the beach, and busting synchronized dance moves at karaoke. At least that’s the premise put forth in a new ad for Nando’s chicken. The South African fast food brand is known for pushing the boundaries of good taste in the name of buzz. In the commercial, which is promoting its chicken six-packs, Nando’s conjures an image of how lonely life must be as an autocrat in late-2011, when most of one’s peers have been permanently deposed. 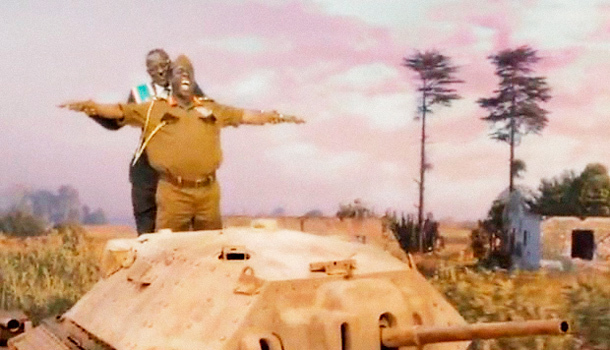 By depicting Zimbabwean president Robert Mugabe reminiscing over his lost “buddies” in various comically pedestrian scenarios, the ad humanizes these leaders. Perhaps excessively so. Soon we see “the last dictator,” Mugabe, interacting with several other departed despots while the tune “Those Were the Days” plays In the background, giving the ad a sitcom-opening-credits feel. Mugabe takes a Titanic-mimicking tank ride with a rapturous Idi Amin, makes beachside sand-angels with Saddam Hussein, and pushes Apartheid-era South African Prime Minister PW Botha on a swing. Judging by how much fun they seem to be having, you almost don’t immediately recall the countless death tolls each of these men has to his credit. Seeing these dictators who ruled by fear presented in a ridiculous context might provide a cathartic moment for anyone who ever lived under their rule. Now that they’re (mostly) dead, we can all share a laugh at their expense. Or can we? It’s also reasonable to wonder whether it’s too soon after the toppling of Gaddafi to air such an ad, especially considering how much violent unrest remains in the Arab world at this very moment, and, indeed, if anytime is too soon to joke about these characters. The old saying is that tragedy plus time equals comedy, and nothing is sacred forever, but, typically, there has to be a good reason to joke about the un-joke-aboutable. In this case, the reason is a six-pack of Nando’s chicken. The subject matter and the product may simply be too unappetizing even for those who find the ad funny. Nando’s has a history of running purposefully divisive campaigns. The company once based an ad around a 2002 political controversy regarding the mandatory detention of illegal immigrants. Those who’d been detained had waged a hunger strike, some physically sewing their lips shut in protest. The subsequent Nando’s ad suggested that the strikers chose to unsew their lips after hearing that with every Nando’s quarter chicken combo, they’d be getting an extra quarter chicken free. It was, needless to say, not well-received. This latest ad is another Nando’s-backed test of consumers’ appetite for controversy and the theory that any press is good press. We put it to you, readers: is Nando’s a savvy wielder of earned media, or just exploiting the suffering of its neighbors?